If everything goes well, Malaysia will be one of the first few countries to use British biosensor technology to sniff out dangerous cargo - in particular, drugs and specific number of explosives. Thanks to the hardworking honey bees! Honey bees have 170 odour receptors in their antennae, compared with a mere 62 in mosquitoes and 79 in the common fruit fly. In their everyday lives they use these to identify a host of different smells so that they can find nectar sources at any time of the year. They learn to associate the smell of a flower with nectar, so that when they find a similar flower in another place they know they will find nectar there. When a bee’s antennae is touched with a cotton bud dipped in a sugar solution, it automatically extends its proboscis, or tongue, to drink. By 2015, Malaysia may be one of the first countries to adopt "bee sensory" technology to detect drugs and explosives for airport security. Harnessing the acute olfactory ability of honeybees, UK company Inscentinel Ltd has been developing biosensors that can help detect chemicals found in drugs and explosives. The device, VASOR136, is a user-friendly light-handled detector containing 36 bees. Since last year, Inscentinel had also been working with the UK Home Office and various freight security companies to develop and test the system for cargo environments. Malaysian security firm Independent Guarding Services (IGS) Sdn Bhd had come on board to licence the technology for Southeast Asia when the design was near-completion. 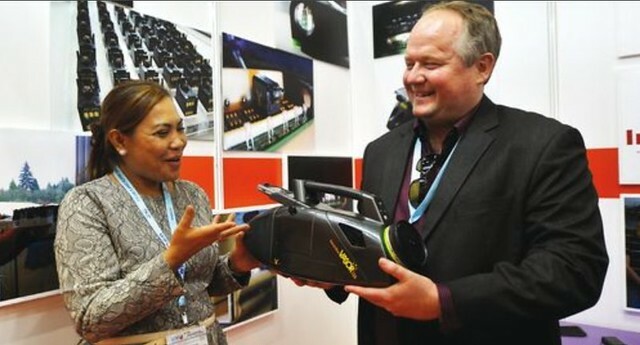 "The technology has an over 80% effectiveness rate," IGS chief executive officer Roselina Mahmood told The Malay Mail during the BIO Malaysia Exhibition at the Kuala Lumpur Convention Centre. "When field trials using local honeybees are completed successfully in the UK and Malaysia, the system will roll out in both countries and will subsequently be marketed to other Southeast Asian nations." Inscentinel Ltd general manager Ivan Hoo said a single honeybee costs only RM1 and takes only five minutes to train, or five hours for 500 bees using their prototype Automatic Conditioning Unit (ACU). By comparison, a sniffer dog would take six months to train and can cost up to RM380,000 a year to use. "Via Pavlovian conditioning, the honeybees can be trained to associate certain odours with a food reward within five cycles," he said. "Held within VASOR136 cartridges, they show a conditioned tongue-extension reflex when encountering learned odours. An optical sensor then records the responses, which are interpreted by the software that outputs a 'present' or 'absent' result." IGS adviser and Independent Protective Services (IPS) Sdn Bhd CEO John Boyd said fundraising requests were being made to the Malaysian government for testing and refining the technology. "The device is of much interest to the police, anti-drug agencies and the immigrations department. Bees can be trained to detect drugs and explosives just as effectively as dogs. However, they can be trained to do both, while dogs can only do either," Boyd said. looks like a lot of bees will be employed soon.